This post is based on the Horror Universe version of the Ghostbusters, from the Horror Crossover Encyclopedia. That book came out before the revelations that the films and the animated series exist in alternate realities, and for that matter, there is a whole multiverse of different versions of the Ghostbusters. The upcoming Cartoon Crossover Encyclopedia, currently being worked on and due out late 2016, will tackle that issue. The Story: The Ghost Busters work for a mysterious man who sends them on missions to dematerialize ghosts. Notes: No relation to the 1984 film Ghostbusters, though Columbia Pictures did pay Filmation for the licensing rights. This series will have an animated spin-off in the 1980s, after the 1984 film made the name popular. It is Ghostbusters and features the sons of the two leads from this series. Real Ghostbusters and Ghostbusters were on the air at the same time. In the Now Comics Real Ghostbusters # 9, Peter mentions the other guys with the gorilla. The Story: Dr. Frankenstein seeks the brain of the world’s most gullible man to place into his monster. And his intended victim is Eddie. Notes: Jake mentions that Tracy’s grandfather had an unfortunate incident at the Empire State Building. This Frankenstein and monster are another of the family and his new creation. It is interesting to note that this was the same plan Dracula had for the monster, in intending to place Lou Costello’s brain in the monster, in Abbott and Costello Meet Frankenstein. The Story: The Ghost Busters encounter the ghosts of Erik the Red and Brunhilda. Notes: Jake says that Tracy’s grandfather has experience climbing the Empire State Building. That would make Tracy the son of the son of Kong. The Story: When three paranormal researchers get kicked out of the university where they were employed, they decide to go into business as ghost exterminators using the new technology they have developed. They are quite successful, despite some mishaps, but the large amount of business they receive is tied to the return of an ancient god. Notes: I can say I am a paranormal investigator because of this film. This film is said to be based on true events according to the animated Real Ghostbusters, which is brought in by a crossover with Lovecraft’s Cthulhu Mythos. This film is followed by a sequel, Ghostbusters 2, which takes place five years later. There is a line in the film that provides a crossover. “The walls of the 53rd Precinct were bleeding...How do you explain that?” The thing is that there is no 53rd Precinct in New York, but there was a fictional New York 53rd Precinct in the classic television shows Car 54, Where Are You? and Baretta. This film has been referenced as fiction, in homage or spoofed numerous times in films and on television. The Story: Following the events of the film, the Ghostbusters continue to take cases where ghosts are required to be captured. Notes: This series presumes that the film Ghostbusters was based on true events. Following this series, there were two later series that were continuations. They were Slimer! And the Real Ghostbusters and Extreme Ghostbusters. It has been referenced as fictional or paid homage to in several films and television series. It was also spoofed in Mighty Mouse and Saturday Night Live. The Story: The Ghostbusters walk through some thick fog and are transported to Victorian era London where they interrupt the events of the three ghosts teaching Ebenezer Scrooge his lesson about the true meaning of Christmas by capturing the ghosts. Returning to the present, they find the world a much colder, darker place. They realize their alteration of the timeline has caused this, and return to the past to set the ghosts free to continue their lesson. Notes: This story brings A Christmas Carol into the Horror Universe. Though a ghost story with spooky moments, I don’t consider the Charles Dickens classic a horror novel. It’s just too ingrained in my mind as a Christmas tale, associated with It’s a Wonderful Life, Rudolph, Frosty, the Grinch, and Charlie Brown. The Story: The New York Public Library puts on display a copy of the Necronomicon, which cultists steal to raise Cthulhu. The Ghostbusters work with Dr. Alice Derleth of Miskatonic University to use an old Lovecraft story to defeat Cthulhu. Notes: Since Lovecraft’s mythos are the glue of the Horror Universe, this crossover brings in The Real Ghostbusters, including the films that inspired the animated series. Dr. Derleth is clearly related to August Derleth, the heir to the Mythos stories. This story, like many others, demonstrates that Lovecraft’s stories were published just as in the real world, but that in the Horror Universe, they were non-fiction. The Story: The premise is that this is an uncovered video tape of a special Halloween event (from the days when we used to tape stuff on TV) where a local news anchor and paranormal investigators are live in an allegedly haunted house. Notes: At the arcade can be seen the game Space Paranoids, which is from Tron. Also, the Ghostbusters are mentioned, which is likely a pop culture reference, but I’m counting it as a real link so that I could connect this film to the Horror Universe. The Story: The Ghostbusters are hired by a descendent of Ichabod Crane, who is pursued by the Headless Motorcyclist. Notes: Based on this story and others, we know that the Headless Horseman takes different modern forms in different eras. We also learn that Crane’s family has been cursed to be haunted by this particular ghost throughout the ages. The Story: A boy is falling under the influence of a Grundel, a ghost that manipulates children into being bad. Notes: A jabberwock appears in this story. The Story: Dr. Egon Spengler explains that some UFOs are actually ghost aliens. Notes: The aliens of the story, which Spengler references as ghosts, are called the Gwanzulum. They have appeared in several titles of the Marvel UK line. In Doctor Who Magazine, they are shape shifting, mind reading aliens. Unfortunately I could only identify the above listed crossovers, but there are several sources that say they have appeared in more titles, but don’t mention which ones. The Story: The ghost of Captain Nemo amusingly haunts a subway sandwich shop. Notes: Nemo already has several mentions firmly placing him in the Horror Universe. The Story: The Ghostbusters travel to Grover’s Mill, New Jersey to bust the ghosts of the Martians from the 1938 invasion, and encounter a different group of Martians. Notes: The IDW Real Ghostbusters seems to be set in the late 1980s based on most evidence. This story was part of a major company wide crossover, but unlike DC or Marvel, IDW has mostly licensed properties. Rather than have them coexist, they have one story take place over a range of dimensions. Thus, the Ghostbusters and War of the Worlds links are both to the Horror Universe, but all the other above listed crosses come from alternate realities in the Horror Multiverse. The premise is that these Martians invaded a series of realities. Note that of the above, only Ghostbusters, Zombies vs. Robots, Popeye, Kiss and Transformers actually had comic stories published. The other crossovers come from extra covers that had no accompanying stories, but were still considered to be valid parts of the overall invasion. The Buffy cross comes from one of those covers, for Mars Attacks Spike. This is a cross with the divergent Season 8 timeline. The Story: Ghosts are haunting a television studio. Notes: Peter and Egon have a conversation in which it’s pointed out that the Ecto-4 has a Flux Capacitor, and that this would come in handy should they ever encounter Godzilla. Back to the Future is already in via Monster Squad and So You Created a Wormhole. This confirms its existence in the Horror Universe. And of course, Godzilla was brought in via a cross with King Kong. The Story: The Ghostbusters rescue a boy from a cult trying to raise a demon. Notes: Peter acknowledges the existence of another team of Ghost Busters with an ape. This is a reference to the live action children’s show called The Ghost Busters that was introduced in 1975, and later got its own animated show in 1986 following the success of the Ghostbusters films. They are the reason that the animated spin-off of the films had to be called Real Ghostbusters. So this crossover makes it clear that both teams exist in the same reality, the Horror Universe. The Story: After having been shut down due to the mess they made of the city when they destroyed the Stay Puft Marshmallow Man, the team has gone in separate directions with new jobs. But when a supernatural slime under the city starts bringing the ghosts back, the team reunites. Notes: The film would seem to contradict the animated series, in that the series has the team continue to operate over the past five years, while the film implies that the team went under shortly after the fight with Zuul. It’s been suggested that perhaps due to the slow nature of lawsuits, it took five years to shut them down, and they had only been out of business for a few months. The fact that Slimer shows up a few times in the film, hanging out at the firehouse, and helping in the final battle, would indicate that the animated series did happen before this film. The main supernatural villain of this film, Vigo, is based on Dracula. More specifically, he’s inspired by the historical Vlad the Impaler. In the Horror Universe, Vlad the Impaler is the Count Dracula from Bram Stoker’s novel. Vigo might have been another Son of the Dragon, but it’s doubtful that he was a soul clone. Vigo is quoted as saying just before his execution “Death is only the beginning.” This quote was also said by Imhotep in the 2000s remake of the Mummy and by the villain in the 2000s film Sherlock Holmes. I have done a lot of research to find the source of that quote historically, and have found none. It seems to originate from this film. Viggo of course was an occultist who studied how to return from the dead with great power. Imhotep did as well, and so did the villain from Sherlock Holmes (though in the last instance it was a hoax, but that doesn’t mean he wasn’t still quite the scholar in the occult). I can only conclude that in the Horror Universe, this is an ancient quote from some ancient text of the occult, regarding resurrection. That then provides a link between Ghostbusters and the Mummy, both of which are already in the Horror Universe. It also provides a link to the 2009 Sherlock Holmes film. The 2009 film works for Horror Universe canon, but the sequel must be a divergent timeline. A third Ghostbusters film is currently in development at the time of this writing. This film has been referenced as fiction or paid homage to numerous times in other films and on television. It has also been spoofed on The Super Mario Bros. Super Show, The Van, Yu-Gi-Oh, and Saints Row IV. The Story: The Ghostbusters get aid from the ghosts of Holmes and Watson to capture the ghost of Moriarty. Notes: It does seem likely that Holmes, Watson and Moriarty should have passed away by this point. Though there are some stories that do portray an elderly long lived Holmes in the 1980s or later, none have made their way into the Horror Universe canon. And indeed the ghosts of this story are actually tulpas, created by the powerful psychic energy created by the fans who have read the stories by Doyle. In fact, this story purports that Holmes is fictional, though in the larger scheme of this shared reality, we know that to be untrue. See the later entry for Five Ghosts for more about the Holmes and Watson tulpas. The Story: The pollution caused by humans is literally killing Mother Nature. Notes: This is a mega television crossover event. And despite the silly premise, all the crossed series remain true to the shows and films they come from. There is an appearance of Elong Spengler, president of Waste Busters. He is said to be the brother of Egon Spengler of Ghostbusters and is played by the same actor. And yes, the Muppets are in this. To explain the existence of Muppets in the Horror Universe, I reference the Angel episode in which puppets are brought to life possessed by demons. Or the Buffy episode with a human turned into a dummy. Or Chucky from Child’s Play. Murphy Brown, Doogie Howser, Cheers, the Cosby Show, the Golden Girls, and Married with Children are all standard sitcoms and are brought into the Horror Universe by this cross. Looney Tunes characters are animated drawings brought to life by the Necronomicon ex Mortis based on the film Evil Toons. Back to the Future is already well established as part of the Horror Universe, but this appearance of Doc Brown and his Delorean is a greater confirmation. Nathan Thurm is a character from Saturday Night Live, but just as with the appearance of Father Guido Sarducci in Casper, this cross does not bring in the entire cast of characters from SNL. Finally, this cross brings in the loveable alien E.T. The Story: The Ghostbusters travel to Russia to stop a cult from using the Necronomicon from raising the Old One known as Cyaega. Notes: There are also references to the events of the Collect Call of Cthulhu. The Story: In INFESTATION, a vampire/zombie hybrid with the powers of a goddess traveled through space-time to seek particular ingredients for a spell and used different types of zombies in each 'zone' to achieve her goals or to distract the locals as she achieved them herself. Notes: Infestation is the first IDW company wide crossover and in fact an intercompany crossover as well. IDW consists of mostly titles featuring licensed series. They have managed the brilliant way to still put out crossovers of all their titles by involving time and interdimensional travel. Zombies vs. Robots must be in an alternate reality within the Horror Multiverse. Ghostbusters is of course in the Horror Universe. 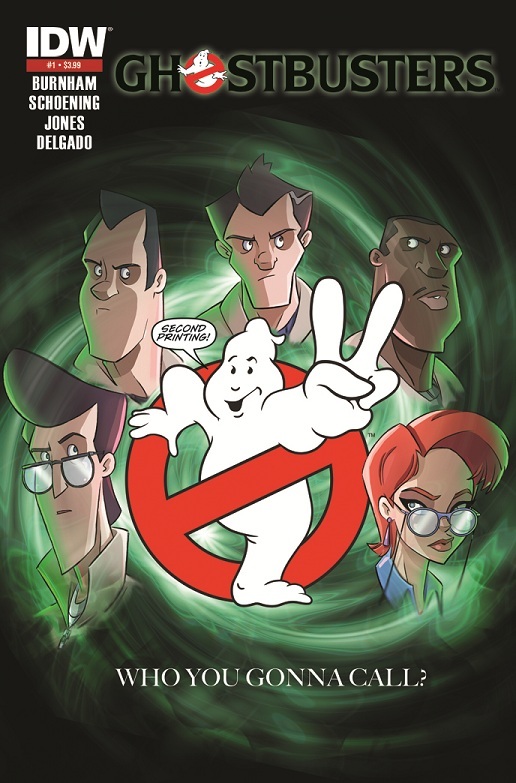 See the entry for the IDW Ghostbusters series for more on continuity and placement. CVO is a secret government agency of vampires. It may exist in the Horror Universe, but because of the multiversal nature of this crossover story, it’s hard to tell. At the very least , it’s part of the same multiverse. G.I. Joe and Pocket God also can be placed in the Horror Multiverse, but not necessarily the Horror Universe. Incidentally, Pocket God is a comic from Ape Entertainment, thus making this not only a company wide crossover, but also an intercompany crossover. Though this cross can’t place Transformers in the Horror Universe, IDW’s later Conspiracy crossover does. My fellow researchers, who are more familiar with IDW, ensure me that this does not bring in all Transformers stories, but only certain IDW Transformers storylines. And Star Trek has already been established to exist in one of the alternate future timelines of the Horror Universe. Infestation # 1 -2 did not tell the whole story, but rather were simply the bookends. The entire story was told in the following: Infestation # 1, Star Trek: Infestation # 1 - 2, Transformers: Infestation # 1 - 2, Ghostbusters: Infestation # 1 - 2, G.I. Joe: Infestation # 1 - 2, Infestation # 2, Infestation: CVO 100-Page Spectacular, Pocket God: Infestation # 1, Zombies vs. Robots: UnderCity # 1 - 4, and Infestation: Outbreak # 1 - 4. This crossover is followed by a Cthulhu Mythos based Infestation 2 and then a Mars Attacks crossover. The Story: More adventures of the Ghostbusters in the era just following the Real Ghostbusters cartoon and comic. Notes: Back to the Future, Supernatural and Alice in Wonderland are already in, but this series brings in the A-Team, Knight Rider, Beverly Hills Cop, and the Blues Brothers. The Story: A new invention (presumedly created by Donatello) accidentally teleports the Turtles from their New York to the New York of the alternate universe of the Ghostbusters. Notes: At the time of this writing, this book isn’t out yet, and I’m going off of the official press release and speculative analysis of my fellow crossover researchers. The book seems to take place in the original era of the Ghostbusters and Turtles. This appears to be an interdimensional cross. It’s an easy presumption that the Ghostbusters are the same that we’ve seen thus far to exist in the Horror Universe. Based on the cover art and the presumed setting, I had assumed this to be the original version of the Turtles from Turtles-Prime. But as was pointed out to me, those Turtles all wore red masks. The film Turtles Forever shows that every version of the Turtles exists in its own separate reality, and since this version doesn’t seem to tie in with the canon of any previous version, these Turtles must come from a new, never before seen reality. Of course, there are also Teenage Mutant Ninja Turtles in the New York of the Horror Universe. It’s weird that they didn’t run into each other. The Story: Hellboy takes on Rasputin. Notes: De vermis Mysteriis appears, providing a link to Lovecraft and Robert Bloch’s The Shambler in the Stars. That brings in the Hellboy films, both the live action and animated. The film has a contemporary setting, but should be placed in the start of Hellboy’s story in the comics, which was in 1993. Though this crossover only brings in the films, the Hellboy comic book crosses with Buffy the Vampire Slayer and Angel, thus bringing in the Hellboy comic. Having both the films and comics in the same reality could be an issue, but I don’t think they are totally incompatible. Likely they are both adventures of the same Hellboy, and occasional inconsistencies could be overlooked with my often used scapegoat excuse about different perspectives. Rasputin was a real historical figure, who like Cagliostro, has been fictionalized to become a powerful evil sorcerer of the Horror Universe. The Jar Babies from the Devil’s Backbone are on display in the BPRD trophy room. The maze of blood that revives Rasputin is the same pattern as Pan’s Labyrinth. In the prologue, the nazis open a portal to the crystal prison of Ogdru Jahad. In Pacific Rim, when entering the other dimension, Gypsy Danger sees the crystal prison. Pacific Rim takes place in a divergent timeline of the Horror Universe. Sammael is identified as a Class Five Entity, based on a system from Ghostbusters. The Spear of Destiny seen in this film also appears in Constantine. The Hellblazer comics have established that the Constantine film takes place in an alternate reality. This film is followed by Hellboy II: The Golden Army and Hellboy 3 (in development at this writing). This film has been referenced as fictional and paid homage to numerous times in other films and on television. It has also been spoofed in The Supermarket. The Story: A single father and his teen daughter move into a house haunted by four ghosts. Notes: This film version of Casper that takes place in the 1990s is in the Horror Universe due to the Ghostbusters cross. This does not bring in the cartoon or comics. It does bring in the live action sequels though. The crosses come from a couple of scenes in which both Ray Stanz of Ghostbusters and Father Guido Sarducci are brought in to rid the house of the spirits. Both find the Ghostly Trio to be too scary. Father Guido Sarducci is the comic creation of Don Novello, most well known for his appearances on Saturday Night Live. This link does not bring in the entire cast of characters from Saturday Night Live. This film is followed by the prequel, Casper: A Spirited Beginning, and several other sequels. This film has been referenced as fictional or paid homage to numerous times in other films and on television. It was also spoofed Tiny Toons’ Night Ghoulery. The Story: Every town has an Elm Street. And Freddy finds his way to Elm Street in Denver. The nephew of Egon Spengler forms his own team of Ghostbusters to bust this famous ghost. Notes: Though a fan film, the original characters created for this film became canon in the officially licensed Ghostbusters video game. The Story: The “player” goes on quests in a fantasy realm. Notes: There is a reference that sorcerers should be careful not to “cross the streams”. This is a reference to the proton packs in Ghostbusters, and the line said by Egon. Warcraft includes elements of time travel and other worlds, so its possible that the crossing the streams of powerful energies is a universal rule. The Story: Spike is asked to rescue a half-demon girl from an asylum that wishes to exorcise demons from humans. Notes: The Asylum was designed by Ivo Shandor, of the cult of Gozer worshippers. Shandor was also the designer of the building which Dana Barrett resided in Ghostbusters. It’s unclear if this story takes place during the final season of Angel or if it takes place in the divergent timeline of the Buffy Season Eight and Angel: After the Fall. Even the writer has chosen to remain vague when confronted with the question of time placement. The Story: The Middlemen deal with a haunted sorority. Notes: Lots of Ghostbusters references, but two that make for valid crossovers. First, there is the Egon Spengler Memorial Award for Excellence in Physics. Of course, this implies that Spengler might be dead. But not necessarily. And in fact, Egon will appear in stories that take place after this, so no, he is not dead. The other is a reference to a PKE Meter. PKE Meters have shown up as a prop in many films, usually not being used to detect ghosts nor being called a PKE Meter. I don’t count those. But in this instance, it’s called a PKE Meter. The Story: The Lone Gunmen uncover computer files from the future, that reveal an impending plague that will destroy humanity. While Mulder and Scully investigate one lead, the Lone Gunmen investigate leads involving the Ghostbusters, the Crow, the Teenage Mutant Ninja Turtles, and the Transformers.